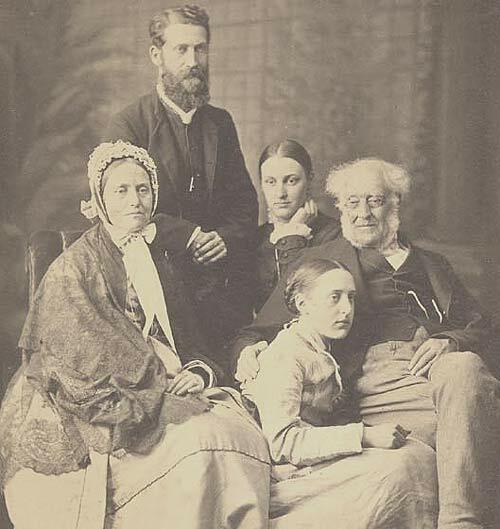 L to R: Frances Ellen Awdry nee Carr, Frederick D'Austini Cremer, Mary Awdry, another Awdry daughter and John Wither Awdry. John Wither Awdry born 1795 in Swindon, Wiltshire (Indian Judge, Justice of the Peace, M.A. and Hon DCL Oxford. 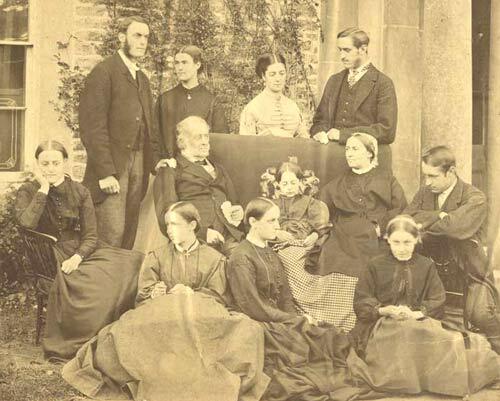 Barrister) and Frances Ellen Awdry (nee Carr) born 28 July 1820 in Bombay, India and some of their children at Notton, Wiltshire, the family seat. John and Frances met in India, she was the daughter of the bishop, he the Lord Chief Justice. His first wife, Sarah Maria Awdry, had died. He had 3 children by her and another 10 by Frances. Family legend has it that Fanny Awdry was such a gooseberry that when suitors came to see her sisters that she suceeded in scaring some of them off.